English, John R.. "Wartime Elections Act". The Canadian Encyclopedia, 30 August 2017, Historica Canada. https://www.thecanadianencyclopedia.ca/en/article/wartime-elections-act. Accessed 23 April 2019. The Wartime Elections Act of 1917 gave the vote to female relatives of Canadian soldiers serving overseas in the First World War. 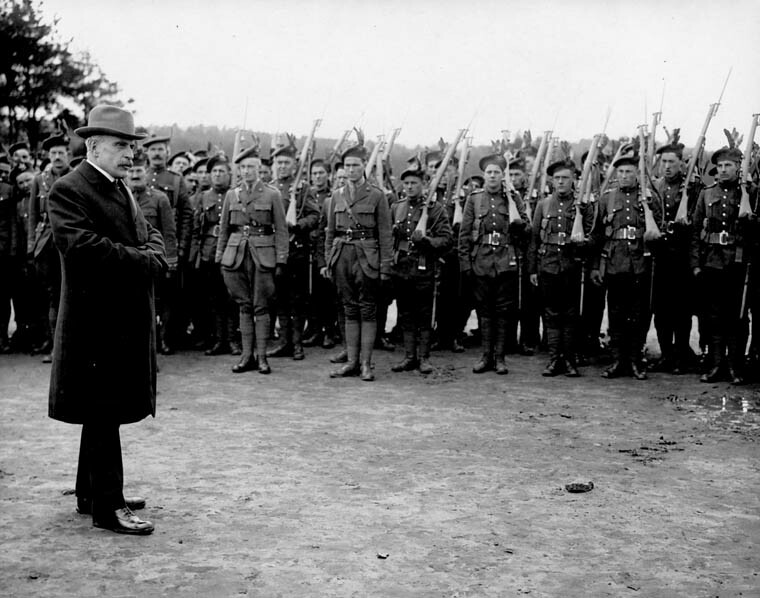 Prime Minister Robert Borden addresses Canadian troops in England during the First World War, ahead of the 1917 Canadian election. The Wartime Elections Act of 1917 gave the vote to female relatives of Canadian soldiers serving overseas in the First World War. It also took the vote away from many Canadians who had immigrated from "enemy" countries. The Act was passed by Prime Minister Robert Borden’s Conservative government in an attempt to gain votes in the 1917 election. Robert Borden's Conservative government had introduced conscription in May 1917, to bolster Canadian fighting forces in the First World War. Conscription deeply divided the country — English-speaking Canadians were largely in favour, while French-speaking Canadians and others not of British descent were opposed. The Conservatives feared that opponents of conscription, including the opposition Liberal Party, would join forces to defeat the Conservatives in the upcoming general election, which would be held in December. An anti-conscription rally in Victoria Square, Montréal, Quebec on May 24th, 1917. Image courtesy of Library and Archives Canada/C-006859. Borden made several political moves to strengthen his position ahead of the election. He convinced many pro-conscription Liberals and other opposition MPs to join the Conservatives in a Union government to push for conscription and steer the Canadian war effort. He also changed the rules about who could and couldn't vote in the coming election by introducing the Wartime Elections Act. The Act was designed to create legions of new voters who were likely to support the Unionists, and to disenfranchise voters who would likely be opposed to conscription. On 20 September, after an angry debate, Parliament passed the Act. The new law disenfranchised Canadian citizens who had been born in "enemy" nations after March 1902, unless those citizens had a son, grandson or brother on active duty in the Canadian military. Meanwhile the Act granted the vote to the wives, mothers and sisters of serving soldiers, as well as to women serving in the military. Canadian women had previously been denied the right to vote in federal elections. 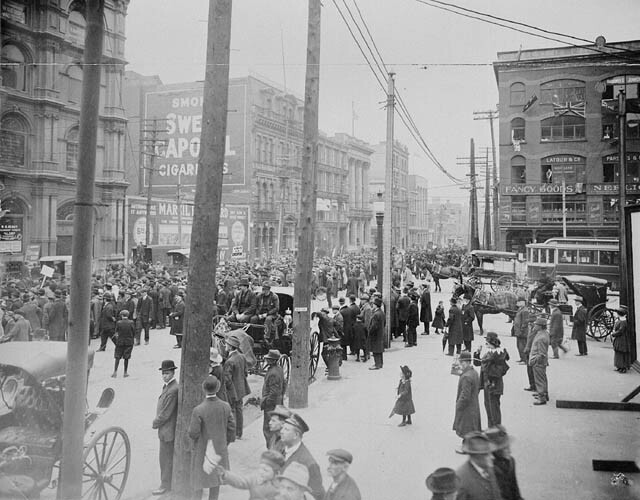 Canadians, most of whom supported conscription and the war effort, also supported the Act. The Act undoubtedly increased support for Borden's party, but was not ultimately a major factor in the 1917 election, which the Unionists won. For decades afterwards, Conservative support in Québec, and among some ethnic and immigrant groups, was badly damaged. In the vote on 17 December 1917, some 500,000 Canadian women participated for the first time in a federal election. The Act was repealed at the end of the war, although by 1918 all women born in Canada over the age of 21 would permanently gain the right to vote in federal elections. The Act's legacy is contentious, as it both provided many women with the vote for the first time, while also legitimizing in law many widely-held anti-immigrant fears.